Microsoft’s HoloLens is now available for pre-orders to developers, the company announced on a blog post. 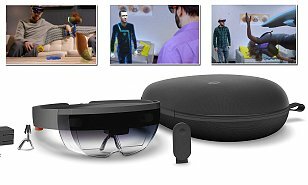 The Holograhic gadget however comes at a bank breaking $3000 price..
Microsoft unveiled the HoloLens about one year ago and has since then focused on partnering with developers and connecting with commercial customers to develop a near perfect holographic experience. The HoloLens remains the first and only fully untethered holographic computer. It’s the only AR gadget that enables holographic computing natively without requiring markers, external ca, and no connection to a PC. Microsoft is inviting pre-approved developers of the augmented reality(AR) gadget to put in their orders that are set for a March 30th shipment. Additional development tools like Visual Studio projects and a HoloLens emulator will likely be released when HoloLens devices start shipping to customers. HoloStudio allows ‘people to create 3D images in 3D – at real-world scale.’ It allows you do a variety of different things, including; Creating 3D in 3D, using a suite of mixed reality tools, taking mixed reality pictures and videos of your creations placed in the real world. It also allows you Build directly on objects and surfaces around you as well as 3D-print your creations and Share them online. The HoloLens is powered by a custom-built Microsoft Holographic Processing Unit (HPU), is packed with Multiple environment understanding sensors and features an Intel 32-Bit architecture. The tech firm says the battery can last for about two to three hours, with up to two weeks of standby time. The Holographic device weighs just a little over one pound and consists of a 64GB of Flash memory backed by a 2GB RAM. Developers who get the HoloLens will also have instant access to hundreds of UWP apps through the Windows Store – “great and familiar apps like OneDrive, Maps, Remote Desktop, People, Movies & TV, Groove Music and Microsoft Office apps.” The Microsoft HoloLens Development Edition also gives developers access to a showcase of holographic app experiences to help get them started and inspire them to build great apps for the platform.